What is the cheapest way to get from Orio al Serio to Cremona? The cheapest way to get from Orio al Serio to Cremona is to bus which costs 8€ and takes 2h. What is the fastest way to get from Orio al Serio to Cremona? The quickest way to get from Orio al Serio to Cremona is to drive which costs 12€ - 19€ and takes 1h 4m. Is there a direct bus between Orio al Serio and Cremona? Yes, there is a direct bus departing from Orio al Serio and arriving at Cremona. Services depart once daily, and operate every day. The journey takes approximately 2h. How far is it from Orio al Serio to Cremona? The distance between Orio al Serio and Cremona is 66 km. The road distance is 96.6 km. How do I travel from Orio al Serio to Cremona without a car? The best way to get from Orio al Serio to Cremona without a car is to bus which takes 2h and costs 8€. How long does it take to get from Orio al Serio to Cremona? 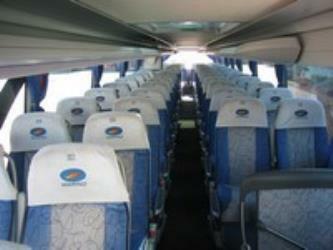 The bus from Orio al Serio to Cremona takes 2h including transfers and departs once daily. Where do I catch the Orio al Serio to Cremona bus from? Orio al Serio to Cremona bus services, operated by Marino Autolinee, depart from Orio al Serio station. Where does the Orio al Serio to Cremona bus arrive? Orio al Serio to Cremona bus services, operated by Marino Autolinee, arrive at Cremona station. Can I drive from Orio al Serio to Cremona? Yes, the driving distance between Orio al Serio to Cremona is 97 km. It takes approximately 1h 4m to drive from Orio al Serio to Cremona. How do I get a bus ticket from Orio al Serio to Cremona? Book your Orio al Serio to Cremona bus tickets online with Distribusion. What companies run services between Orio al Serio, Italy and Cremona, Italy? Marino Autolinee operates a bus from Orio al Serio to Cremona once daily. Tickets cost 8€ and the journey takes 2h. Where can I stay near Cremona? There are 140+ hotels available in Cremona. Prices start at 46€ per night. The Loggia dei Militi (Italian: "Soldiers' Loggia") is a historical building in Cremona, northern Italy. As reported by an inscription on its façade, it was built in 1292. Villa Verdi is the house that composer Giuseppe Verdi owned from 1848 to the end of his life in 1901. It is located in the village of Sant'Agata in the commune of Villanova sull'Arda in the Italian province of Piacenza less than two miles from the village of Le Roncole, where he was born in 1813, and the town of Busseto where he lived from 1824. The Teatro Comunale Ponchielli, as it has been known since 1986, is an opera house located in Cremona, Italy. For more than 250 years it has been that city's primary venue for opera and other theatrical presentations. Teatro Giuseppe Verdi (the Giuseppe Verdi Theatre) is a small opera house located in a wing of the Rocca dei Marchesi Pallavicino on the Piazza Giuseppe Verdi in Busseto, Italy, a town closely associated with the life of the opera composer, Giuseppe Verdi. From the 13th century, the “rocca” or “fortress” was the family’s palace; it is now the city hall after being acquired by the municipality in 1856. The theatre opened on 15 August 1868 and seats 300. Rome2rio makes travelling from Orio al Serio to Cremona easy. Rome2rio is a door-to-door travel information and booking engine, helping you get to and from any location in the world. Find all the transport options for your trip from Orio al Serio to Cremona right here. Rome2rio displays up to date schedules, route maps, journey times and estimated fares from relevant transport operators, ensuring you can make an informed decision about which option will suit you best. Rome2rio also offers online bookings for selected operators, making reservations easy and straightforward.